This Plumber Mug is the perfect gift for the plumber who is a coffee or tea drinker! The mug features a colorful design with a clever saying that plumbers everywhere will relate with. There is also a similar miniature design on the inside of the mug! The mug is made from fine porcelain and is microwave and dishwasher safe. See more info. below. 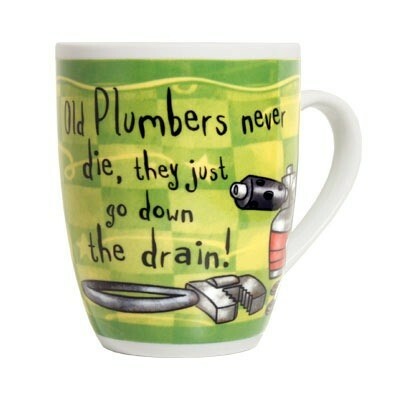 Saying Outside of Mug: Old Plumbers never die, they just go down the drain.